Think it might be time to embrace an Enterprise Resource Planning (ERP) solution or upgrade outdated systems to give your business a competitive edge in 2019? Gain total insight into the ‘why and how’ of modern ERP software implementations to help you take action. In just a short time there’s been momentous leaps and bounds in the way technology enables us to communicate, capture and use data, and lighten the load on our human workforce when it comes to manual tasks and complex analyses. The business world has changed enormously as a result. Innovation in business models, products, and services is now seen as essential to maintaining a competitive advantage. However, there’s still room for progress in many organisations, who aren’t yet fully benefiting from technologies that streamline and automate daily tasks and provide the insight required to improve decision-making and customer experience. Which is why many savvy C-suite leaders will make 2019 the year they harness the power of Enterprise Resource Planning (ERP) software. If you want to tackle digital transformation in your small to medium enterprise in 2019, this up-to-the-minute guide covers: why an ERP solution is necessary; how to choose the most effective ERP software; and what makes for a successful implementation. You’ve outgrown your basic accounting software: Your company has grown larger or more complex and your existing software doesn’t allow you to report in a timely way and provide high-level advice to the Board. You’re tired of manually compiling consolidated financial reports and manipulating data to reveal details of costs and performance at the regional or team level. You have an ERP or bespoke solution that’s past its prime: You implemented a solution many years ago but your ERP hasn’t stayed current or hasn’t been well supported. Without the functionality you need now, your team is wasting time on convoluted workarounds (rather than benefiting from features that reduce duplication, save time and enhance productivity). In the first scenario, you might wonder if moving from an accounting platform to ERP software is overkill or not a good fit for your industry or business type. In the second, you might be disillusioned with the idea of one platform that can ‘do everything’. The breadth and depth of what an ERP solution can do has evolved significantly since the early days. In the 70s and 80s, the software was more limited to technical materials requirements/resources planning (MRP) functionality to support manufacturing and the associated management of shop floor, distribution and accounting tasks. Today, leading ERP solutions provide a truly comprehensive way to manage whole-of-business workflows and data for every kind of business—often within a Software as a Service (SaaS) model that makes IT management more reliable and cost-effective. Vendors like SAP, Sage and MYOB are examples of companies pioneering the digital economy by developing market-ready solutions that make the most of technologies such as cloud computing, data analytics, automation, IoT, machine learning, and more. Your data is readily available in the cloud, consistent across every office or warehouse you operate, and upgrades can be applied easily (and often automatically). You can facilitate a remote workforce or do business via your smartphone while ensuring all employees are working with the same data regardless of where you operate across Australia or around the globe. One of the most compelling reasons to choose an ERP solution over software that is purely ‘web-based’, is the granular level of customisation that’s possible. Reputable ERP solutions have experienced reseller partners worldwide that work with you to tailor your ERP to match the specific structure, workflows and reporting needs within your enterprise. Which ERP Software modules are key to your business? Tailor your ERP to match the specific structure, workflows and reporting needs within your enterprise. Yet customisation isn’t constraining in the modern ERP solution. In 2019, world-leading ERP vendors offer more flexibility than ever before: you can pick and choose from modules that reflect what you need right now and add new functionality as you grow—whether it’s additional modules from the same vendor, affiliated third-party providers, or via seamless integrations. You might start out with a focus on financial management to support the CFOs growing responsibilities for corporate performance, but then it’s easy to build-out your ERP’s functionality in following years—say, to include an HR management component—as your team expands. As your business grows or business conditions change, modern ERP solutions can adapt. We’ve established that implementing a new ERP in 2019 is smart if you need greater visibility, insights and automated workflows within your organisation. Following the steps outlined further within this post will help CEOs and CFOs gain greater clarity around the factors to consider in selecting the right ERP and what to expect at each stage of the process. But first, it pays to quickly cover where many people go wrong, so you can avoid common pitfalls. 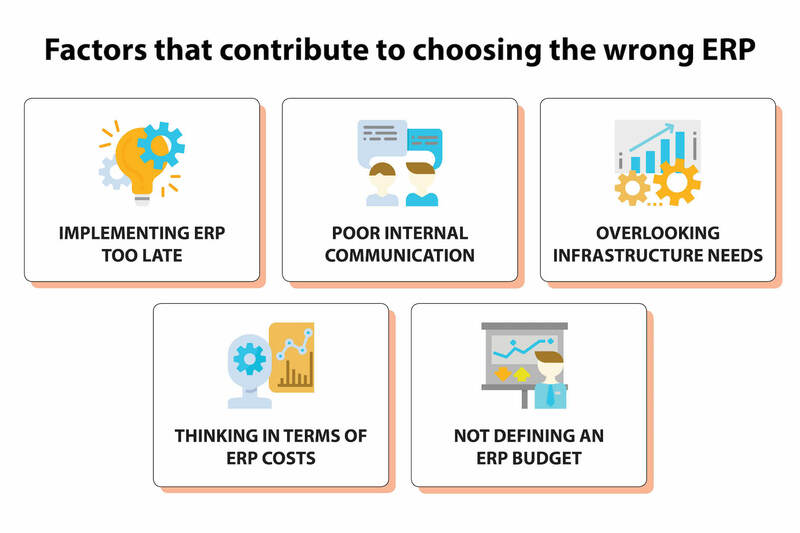 What leads to choosing the wrong ERP software solution? Delaying implementation despite an obvious lack of speed, capability and reporting finesse within your business (and growing internal frustration among your employees). Failing to effectively consult internally in order to comprehensively define your technical requirements for each department and team. Not weighing up the pros and cons of cloud versus on-premise early in the process. Thinking in terms of costs alone, rather than how to best enable business process improvement and growth. Not defining a budget in order to narrow your search parameters and establish clear expectations internally and with your third-party provider. Here are the essential steps to follow to make a well-considered choice as you explore your ERP options in 2019. Start by imagining your future state. 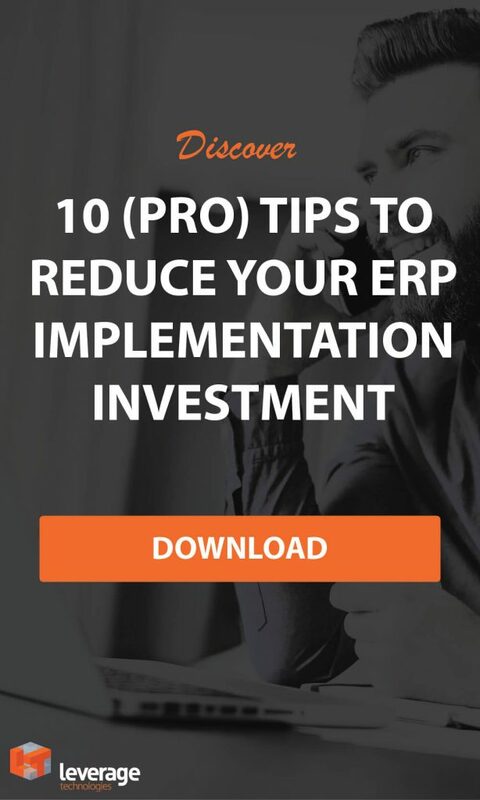 How will you know if you’ve chosen the right ERP and had a successful implementation in 12 months from now? or less machinery downtime on your production line. In this early stage, it’s also important to reflect on the processes and structures within your business that must be mirrored in the ERP solution you set-up. It can be helpful to examine your current systems (digital or otherwise) and generate a list of the advantages and drawbacks for each—to help you identify gaps, and the functionality you want to retain. Do you need the scalability of cloud-first software? In comparison to an on-premise system, software hosted in the cloud is delivered via a subscription-based licensing model which means no large, upfront capital expenditure. There’s also no need for expensive, onsite IT infrastructure and ongoing support to maintain security. Is mobility essential? Interfaces that can be easily accessed via mobile devices support a productive workforce now and into the future, with the rise of remote work and telecommuting. Also, handheld technologies are increasingly being used to support workers in the field, on the shop floor or in a warehouse to do their jobs better—which should connect to your ERP. What kind of database do you need? Is big data management a current or potential future concern for your business or industry? What level of security, support and scalability do you need in relation to the database underpinning your ERP? Are there tools you’ll be using that must be integrated? Identify any essential programs that you will continue to use that should be integrated with your ERP software, e.g., MS Office. Will you be adopting IoT, AI, AR, VR etc. within your products or systems? When you consider the emerging technologies that may become commonplace in your industry, your choice of ERP is affected. An enterprise connected by a powerful ERP solution with automation and machine learning capabilities that can leverage data from multiple sources. Is e-commerce and geolocation marketing important? Is being able to trade online seamlessly or implement location-based marketing tools like beacons vital for your future growth? Your ERP should allow for e-commerce, customer relationship management, and EDI integration. Refer back to the notes you created in step one—was there functionality from the systems you currently use every day that must carry over into a new solution? What were the gaps? Ask a ‘functional head’ from each department to review and document requirements based on their day-to-day activities. Use your business structure and planning documents to help determine features you need: for example if you operate in multiple countries or have multiple ABNs, you need functionality to support cross-entity consolidation. Don’t focus on features that you only might need. If you don’t currently have complex manufacturing management needs, don’t prioritise that functionality. You can grow into your ERP solution and add new functionality as needed. Refine your notes into a high-level checklist (1-2 pages) that you can use to drill down into the detail as you know more about what’s possible within different software. How much should you spend on ERP software in 2019? What’s the typical investment required for a company of your size? The answer will vary depending on your businesses requirements, number of users, customisations, integrations and your implementation needs. However, ERP investments tend to range from between $20,000 to more than $1 million for a larger corporation with more than 1000 employees. In this day and age, there’s a treasure trove of free information available online to help businesses research their software options. There are excellent blogs, comparison sites, and case studies that can help you understand the ERP market and differences between products. Remember though that the information available online is general in nature, and pricing will not always be transparent. That’s because each company’s instance of ERP software licensing and implementation will be unique to them. If you have questions you can always speak to an experienced ERP consultant from Leverage Technologies—we’re genuinely interested in helping you find the best solution to function better, and we’ll be up-front if we think the ERP software we support isn’t right for your business. So, you’ve got a shortlist of products you think might be a good fit. The next step is to seek a proposal from a trustworthy ERP implementation partner, like Leverage Technologies. Because you’ve done the work to define what you want in terms of business process improvements, technology and functionality—this should help ensure you receive proposals that match your needs, which you can assess based on the investment budget you’ve allocated. Keep in mind that if you obtain multiple proposals, there can be differences in price depending on: the software and its licensing model; the providers’ understanding of functionality and customisation required; support options; implementation methodologies and process; and team size and expertise. Some providers may incorrectly scope a project or make assumptions that reveal their lack of experience, which means their proposal doesn’t accurately reflect the true time and effort required for a successful implementation. Implementing new ERP software in a timely way, and within your budget will rest heavily on project management. Your ERP implementation partner and your internal project management team need to work in unison to ensure decisions can be made quickly, scope changes are minimised, and issues can be addressed through internal channels. It’s important to appoint an internal project manager that has the authority, respect and communication skills required to guide your implementation. Other internal muscle should be engaged during your ERP implementation to manage the configuration, training and testing required to deliver a great end result. When will you start and how will you phase testing in order to be ready for ‘go-live’? What kind of test scenarios are required to understand if the system is up-to-scratch? What different test environments are needed to replicate the product environment? What will you measure and how will your record and present test results? What is your change management plan to address issues that arise in testing? Have testers been chosen, and is there a commitment to allocating the time required? It has become unavoidable to use technology to support business process management in one form or another. Even if you don’t consider yourself a ‘digital business’, it’s likely you already use a wide range of software and hardware solutions. The problem is these technologies are often applied haphazardly, creating a hodgepodge of infrastructure, data, skills and understanding across your business. That leads to increased risk, costs, confusion, information silos, and lack of visibility for senior executives. According to a survey of more than 2,400 CEOs and risk managers, the top threat for businesses worldwide in 2019 will be business interruption. A simple example: one misplaced purchase order can lead to backlogs in your production schedule that cost you dearly. Lack of continuity in the systems, data and supply chains you rely on to operate your business can bring things to a standstill when what you actually want is to accelerate and grow. 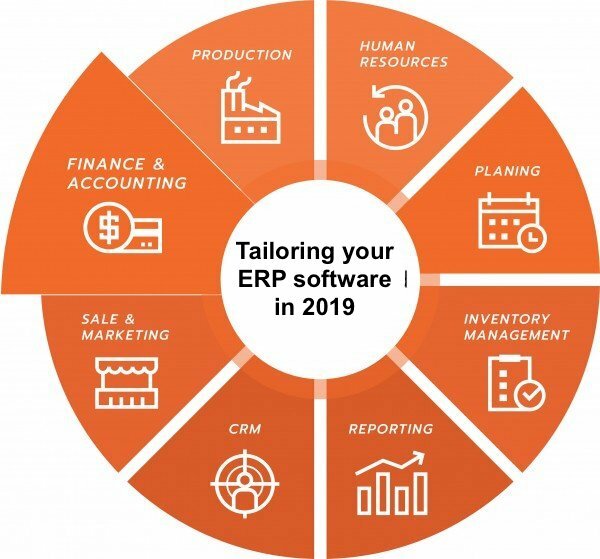 That’s why implementing ERP software in 2019 is worthwhile: especially for businesses experiencing rapid growth that are crying out for a more integrated, coordinated business landscape. Start by examining your business, software and implementation needs step-by-step. Prepare to make this your year to transition to a more integrated, high-level ERP solution that will bring significant benefits to your business in both the short and long-term. Want help to navigate the world of ERP software to ensure you reap the benefits of digital transformation in 2019? Call 1300 045 046 or email info@leveragetech.com.au.